Everyone has a story and we want to hear yours! Tell us what inspires you to spin or weave, what got you started and what keeps you going. We also want to know how Schacht has played a part in your craft. What Schacht tool, be it spinning wheel, floor loom, cricket or drop spindle helps you to do what you love? We are looking for diverse stories from all over the world that we can share with the spinning and weaving communities at large through our print advertising, on-line ads, newsletters, and blog posts. Share your story – and get a little fame in the process. Second Prize (12 winners) – Your story on our blog. Third Prize (up to 30 winners) – an excerpt of your story on our blog. All prize winners will receive exclusive Schacht merchandise. Judging: Our team at Schacht will review the entries and select the winners based on the photos, work, and how engaging a story it is. 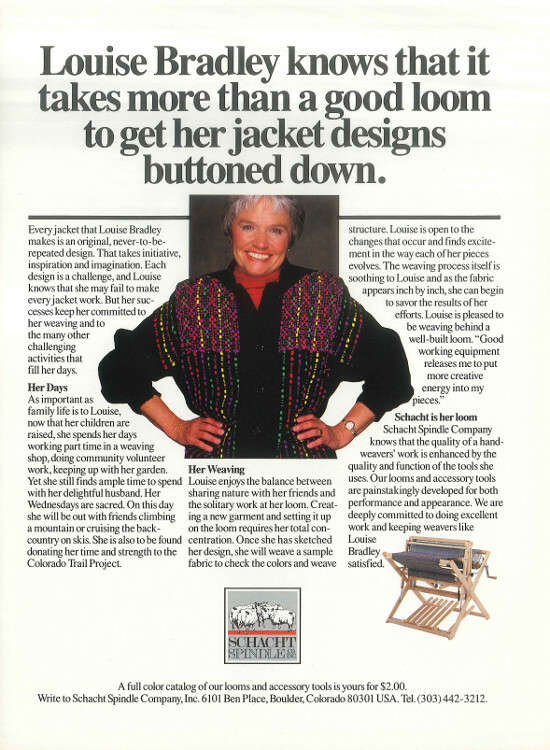 Here’s our ad from our last contest which appeared in the 1989 April/May issue of Handwoven featuring Louise Bradley. *Package includes: Airfare from a major airport from within the 48 contiguous United States, lodging (3 days, 2 nights), food, and transportation while in Boulder, photo shoot and interview, and great times with the Schacht folk. The trip will take place somewhere between Nov 5th and Nov 12th 2015. **Schacht Cash can be used at Schacht Spindle Company towards the retail price of a product. Schacht employees and family members of employees are not eligible to participate in this contest.